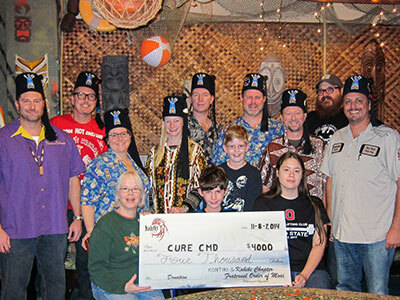 COLUMBUS, Ohio -- A tiki-themed weekend co-hosted by the Fraternal Order of Moai's two Ohio chapters raised $4,000 to help fight congenital muscular dystrophy. Members of the FOM Kahiki and Kon-Tiki chapters recently presented the donation to Cure CMD, a 503(C)(3) nonprofit that funds research and clinical trials to find a cure for congenital muscular dystrophies. "Your continued support of Cure CMD is not only appreciated, but sounds like it could be the most unique and fun fundraiser held each year," said Patrick May, Cure CMD chairman. The funds for this gift were raised at Hot Rod Hula Hop 6, a two-day celebration of "Polynesian Pop" culture on August 8-9 in Columbus. The event included a tropical luau at the Grass Skirt Tiki Room, as well as a vintage car show and "rock 'n' bowl" night featuring live bands and burlesque dancers at Sequoia Pro Bowl. "I am thrilled that the FOM Ohio chapters have been able to continue our support of CureCMD. Being able to make a difference in our on small way is why HRHH is held every year. We look forward to the day that Cure CMD recognizes their goal," said "Beachcomber Brian" Panzo, Kahiki chapter president and one of the event's co-organizers. The Kahiki chapter represents Columbus, where the FOM was founded in 2005. The Kon-Tiki chapter represents Dayton, Cincinnati and Springfield. The Fraternal Order of Moai is an Ohio non-profit corporation and a tax exempt 501(c)(10) Domestic Fraternal Society whose events and activities reflect their core values of Good Works, Fellowship, Spirit, Presence, Preservation and Celebration. Be sure to fire up your engines and save the date! Hot Rod Hula Hop is roaring back to Columbus, Ohio, on August 7-8, 2015. Proceeds from the 2015 event once again will be donated to Cure CMD. For more information, visit the website at hotrodhulahop.com or follow them on Facebook at facebook.com/hotrodhulahop.